This playful primate is ready to dazzle you with his own brand of magic.. This playful primate is ready to dazzle you with his own brand of magic. 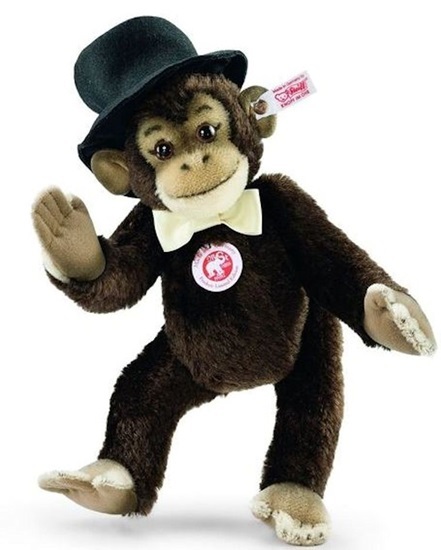 Meet "Frederick" a 14-inch 5 way jointed chimpanzee from the Worldwide Exclusive Collection by Steiff. "Frederick" is sewn from the finest brown Schulte mohair with airbrushed details on his face, hands, and feet. "Frederick" knows card tricks, he can pull a coin out of his ear and once even tried to saw a woman in half! Of course, none of these tricks would work without his black felt magician's hat which is permanently attached to his head. "Frederick" makes a wonderful addition to any collection, alone, or with his companion, "Diva" rabbit, who is sold separately.